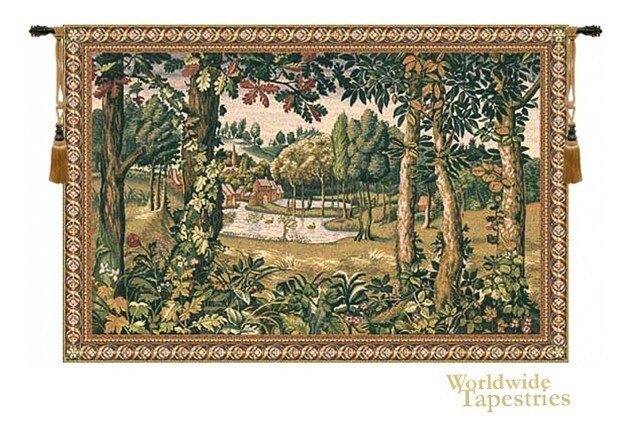 A verdure tapestry showing a forest scene with a village along a river. This work is based on the original created by Michiel Coxcie of Mechelen in the mid 16th century. It was one of the tapestries commissioned by King Sigismund Augustus of Poland, who later was to become Emperor. Over the centuries they were moved from country to country but now, mainly due to wars, but now is housed in the Wawelburcht Castle in Krakow. This tapestry "Hamlet" is backed with a lining and tunnel for easy hanging. Note: tapestry rod and tassels, where pictured, are purchased separately. Dimensions: W 65" x H 43"